A man fell twice through the ceiling of a Shaw's store in Dover, New Hampshire. 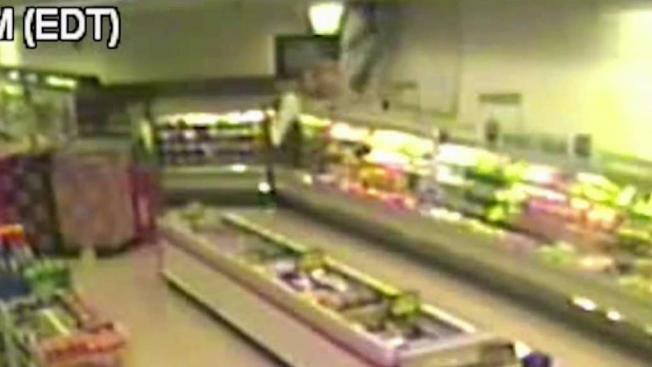 Surveillance video caught the moment when a man fell through the ceiling of a New Hampshire supermarket for the second time, authorities said. Thirty-year-old Eric Lombari faces multiple charges in connection with the incident, including criminal mischief and trespassing. Officers were responding to the scene of a bank robbery in Dover Thursday afternoon when they heard a commotion at the nearby Shaw's supermarket. That's when officers found Lombari's legs hanging above the store's seafood and deli section, according to police. Officers cleared the store, and the man partially fell through the ceiling again above the store's refrigerated meats. Police eventually convinced him to come down and placed him in handcuffs. It's still unclear how Lombari got into the ceiling, but investigators said he saw the police cruisers and ran because he was out on bail in a different town. Moe Olivier walked inside the supermarket to pick up some groceries right after all the excitement ended. "The first one, he came through with just his legs dangling," Olivier said. "Then, he got himself back up, he crawled over by the meat department and his whole body went right through the ceiling." Police said they arrested a different man, James Auburn, in connection with the bank robbery later that evening at Auburn's home. It's unclear if either Lombari or Auburn have attorneys or when they'll be arraigned.